Wonderful hosts and wonderful spot..
We had a lovely time. Set up inside and out was excellent. Our hosts were delightful. I must say that in comparison to other Homeaway stays we have rented in Italy and France these owner represent their property truthfully. Pierette and her husband were just fabulous hosts in providing a great gete that was comfortable, private and picturesque. The two bedroom home just met our needs perfectly in a location that gave us easy drives to both the local wineries and Bordeaux city. Pierette was always right there to help with local info and even enlisted the neighbor to help translate... Can't say enough about this gete and owners.... place to come back to. Stayed here for a week in this delightful property. It was really well equipped, better than my own home, and spotlessly clean. We enjoyed sitting in the garden in the sun, and ate a couple of light meals there. Our hosts were fantastic. They were there when there was a problem and ready for a chat. They were friendly and helpful and ideal hosts. We hope that one day we will be able to return. The area was ideal for touring the wine regions, and it was easy to get into Bordeaux by tram fro a nearby village, once we had worked it all out with the much appreciated help of our host. A big thank you for your good reviews, we will be very happy to welcome you again. We will try to make progress in English for better communication. You are very friendly and warm people. S ubytováním jsme byli maximálně spokojeni. Krásné tiché prostředí, velmi příjemní majitelé (i když mluví pouze francouzsky). Útulný domeček, kde je vše co potřebuješ. Nedaleko krásné město Bordeaux, necelou hodinu jízdy pobřeží Atlantiku. Nejlepší ubytování po našem putování po Francii. We were completely satisfied with the accommodation here. 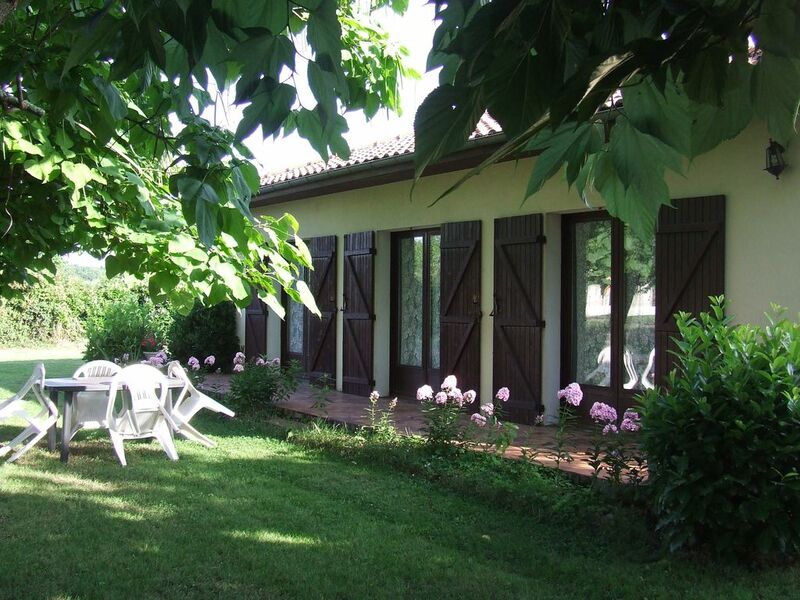 Beautiful, quiet area, very friendly owners (even if only speaks French). Cozy house, where everything you need. Near the beautiful city of Bordeaux, half an hour away Atlantic coast. The best accommodation throughout our travels around France. La maison était conforme à la description et présente un confort parfait malgré une décoration nous fait replonger dans les années 70. Les Hôtes sont charmants et disponibles. En plus il y a la possibilité de garer sa voiture à l'intérieur de la propriété.